Crystal Gayle will be the newest member of the Grand Ole Opry. This is the news out of Tuesday night’s (11-15) Opry presentation where Carrie Underwood surprised the crowd by walking out and inviting Gayle to the legendary country music institution while Gayle was performing her signature song, “Don’t It Make My Brown Eyes Blue.” Obviously, Gayle accepted, and she will be officially inducted on January 21st. “I was sent tonight to ask you if you would like to join our Opry family officially, and be inducted into the Grand Ole Opry,” Underwood said to a surprised Crystal Gayle, who though Underwood was only in attendance to sing a duet with her. Carrie Underwood is one of the Opry’s most active mainstream members, and was in town in between tour stops to do the honors. “I have always felt like I was a member of the family and this is just so special,” Gayle responded. The 65-year-old Crystal Gayle is the younger sister of country queen Loretta Lynn, and has amassed 20 #1 hits and six gold albums throughout her career. Though she commonly performs on the Grand Ole Opry, the induction will make her the institution’s first new member since Little Big Town was inducted in October of 2014. This is one of the longest periods between inducting new Opry members in recent memory, and had many speculating who and when a new Opry member would be named. The induction of Crystal Gayle also is a big win for country music traditionalists who want to see the storied institution embrace more older artists, especially since they are the ones fulfilling the majority of the performance slots these days. There has also been much made about the lack of performances from newer artists who’ve been inducted recently. Picking Crystal Gale ensures the Opry that their newest member will take the honor seriously, and fulfill her performance obligations. Wow. glad to hear this. Don’t get me wrong I’m not overwhelmingly fond of Crystal Gayle, I’d much rather listen to her sister. BUT she’s recorded some really great material AND more importantly will respect the Opry. BUT this isn’t maybe the wisest move from a business perspective. There’s a lot of exciting young talent out there, popular, exciting young talent who could use the exposure AND get more people into the Opry. If you had a Venn Diagram of Crystal Gayle fans, and people who would go to the Opry… you’d have a circle. I would have expected them to at least try and get someone who could draw in people who might not otherwise go to the Opry. Not that I’m complaining this is super awesome. Just trying to look at both sides of the coin. I made a mixtape in High School (that dates myself haha) and it had a few guitar tunes from Roy Clark, some Alvin and the Chipmunks, a bit of Simon and Garfunkel, Charlie Louvin singing “Will You Visit Me on Sundays” and Connie Smith singing “I Overlooked an Orchid” among other things. So that song is partly the soundtrack to graduating high school for me. She’s aged beautifully and is singing better than she did on my old records. But if I were someone like Crystal Gayle, why would I wanna sing a duet with Carrie Underwood?? Carrie could take a lesson or two from Crystal Gayle about phrasing, tonality, and not screaming your head off on the high notes. Drinking is the only rationale explanation for your constant rambling. This is good news! Love me some CG. I thought for sure this was fake news! I have not listened/watched the Opry in decades. When Carrie Underwood is on it, what does she perform? That noise she did on the CMAs or cover classic country music songs? Check out her Church Bells performance at the Opry posted on the Opry’s YouTube channel. She toned down the volume of the vocals and instrumentals in respect for the Opry. I’ll Get Over You is one of the best songs ever. Bravo Richard Leigh, and a great performance, too. Wow . I’m actually stunned to find that CG was NOT a member of the Opry but Little Big Town was ? Who do you have to know ? And the next opry member will be Luke Bryan! Kidding, kind of. As Fuzzy points out the Opry is a business and needs to balance tradition with artists that will grow their brand & bring in more audience. It’d make sense to me if they started to ad members essentially in pairs. An older traditionalist type, & a younger more mainstream star. 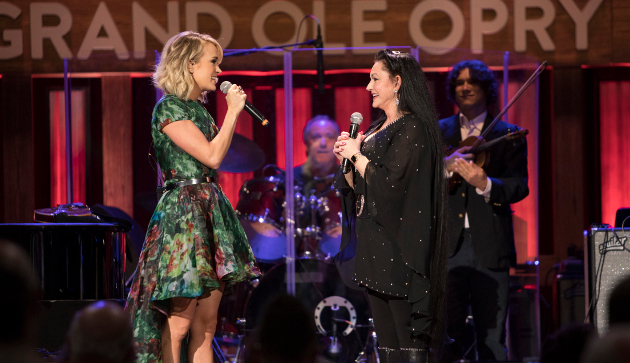 I find it ridiculous that Carrie Underwood is who they picked to invite Crystal Gayle to join the Opry. I don’t have a problem with it. Regardless of what one thinks about her music, she’s the only mainstream top tier artist that takes the Opry seriously. Crystal Gayle forged a trail for female artists, and I wouldn’t be surprised if Carrie Underwood requested to do the honors. You disappoint me Trigger! Carrie Underwood should never have been made a member of the Opry. She may well be a great entertainer and have a tremendous voice but she does not sing country music. She’s a pop singer who occasionally sings a country music song. She’ll be looking for a place in the Hall of Fame next and no doubt is using the Opry to achieve that goal. Hey, I’m not going to sit here and make a case for Carrie Underwood as an Opry member. All I’m saying is that if she’s in, which she is, at least she respects the institution more than any other major mainstream artist right now. Give her credit for that. if she’d ben the only one doing it at the time she’d be remembered a lot more fondly. I kinda agree that she’s just as much a oop singer as anyone else but so were most of her female contemporaries on country radio back when. she’s famous and like trigger says even if her music doesn’t soud super country her attitude towards the Opry makes up for some of that ecause at least it means she cares at puts forth the weffort. I had no idea she wasn’t already a member. It’s about time. I have always been a fan, especially love the song You never miss a real good thing. I’d be interested in the selection process for admission as a member in the Grand Ole Opry , if anyone knows . One would think that you’d have to have been involved in country music for a significant period of time …performing , supporting and heralding its merits….fulfilling a quota of performances AT the Opry , perhaps ? How does a Little Big Town ( really …they are not even a COUNTRY act ..? )….or even a Josh Turner get into the ‘ club ‘ ahead of greats and long-time proponents of country music like Crystal Gale , for instance ? Is there a sales quota a prospective member must hit…? Or am I simply being naive in not assuming its a label- lobbying thing with little to do with the above ? The Opry is a privately-owned business. I’m sure their “selection process” is akin to the selection process for what goes up in Macy’s windows on W. 34th Street in NYC this Christmas season. The management team tries to figure what will sell–They look around, gauge the market, and then someone makes a decision. I don’t think it’s any deeper than that. Hmmm …..that certainly wouldn’t seem to be part of the deliberation process for Crystal Gale , LOS . I can’t imagine them putting her in the window hoping she would sell at this point in her career. They must be rewarding her for career longevity and her loyalty to the Opry , is my assumption . But that is , obviously , NOT the case with Little Big Town or Old Crow MM so it still leaves a question mark with regards to how an artist ” qualifies ” ….no ? LBT is an absolute mystery to me because it seems that even the Opry recognizes them as ” country ‘ artists . THIS in itself seems a huge insult to actual COUNTRY artists . From what I’ve heard on the Opry show on Sirius radio and seen on youtube, I gather that even though they want to bring in younger fans, the Opry’s core segment is still older, retired people–a la Branson.. Bill Anderson seems to have been the main host after Porter Wagoner died. Now John Conlee seems to be the most prominent. I think Crystal Gayle is a perfect fit for that segment. She’s well-known and still glamorous for people of that generation. And she had a slew of hits. (Plus, she has that Loretta Lynn connection, but that’s icing on the cake.) If I were running the Opry, I’d have signed her up in a minute. As far as “LBT” being an insult to country artists? : I don’t think the Opry management sees “induction” as being a big deal or gives a hoot. Just like Macy’s can change its window at a whim, the Opry can get rid of it’s “inductees”–as they did with Holly Dunn. The Opry is in a mess now because they refused to sign hardly anybody for membership in the 70’s and very few in the 80’s, so now there’s a real lack of artists in their fifties and sixties among the members to keep the Opry going full steam. Now it appears anybody can sing on the Opry – even acts without recording contracts – a far cry from decades ago when you had to have a major hit to be invited. And because of this fact there’s very little “hard” country music on the Opry. I like Crystal Gayle and I am glad they put her in the Grand Ole Opry they should put the older ones in their and not these young ones you think nobody wants to hear her well I would love to see her and I know a lot of people that would like to see her. While a lot of Crystal’s songs are not traditional,better the Opry asks her to join as a member than some of these other new singers today,who don’t even come close to Country. Congrats to Crystal on her big honor.